Treadmills are an extremely common sight in gyms and fitness clinics around the world. They allow a user to exercise without needing to go outside, so they are perfect for people who need to run after work or early in the morning. But treadmills have tons of extra features nowadays, so how can someone tell what machine is right for them? Well, that is where this guide comes in. This article reviews two Weslo Cadence machines which provide a convenient form of exercise while keeping the extra features simple and minimal. At its simplest form, a treadmill is a belt powered by electricity which allows a human or animal to walk or run without getting anywhere. They have become one of the most popular exercise machines in the United States and around the world, but they didn’t start there. According to PBS, when the treadmill debuted in 1818, it was actually as a form of punishment for prisoners being held in jail. They would be forced to march on a staircase-like treadmill for up to 10 hours a day, generating energy for nearby mills so the jail could make money off of their labor. Eventually, the use of the treadmill was abolished in the British prisons where it debuted around 1898. It once again became popular around the 1960s when people wanted a machine that would allow them to exercise while staying in place. So, people who think running on a treadmill is a form of punishment actually aren’t too far off from the original definition. Using a treadmill isn’t the end of the world, though. It actually possesses numerous benefits for runners, especially since it allows the user to exercise inside, away from the weather or potential hazards of the outdoor world. In particular, some users like the treadmill because it means they can run anytime and anywhere without having to worry about it being dark outside. Runner’s World emphasizes the importance of running indoors to avoid outdoor hazards and also brings up an important benefit – the treadmill allows runners to simulate any kind of racecourse they need to prepare for easily. Most treadmills of the 21st century have adjustable inclines which allow people to train for hills of all shapes and sizes without the hazards of tripping and falling on natural things like rocks or roots. People can also have a consistent workout every day since they don’t need to worry about darkness or the dangers of running outdoors. Another benefit is that users can safely switch up their exercise routine by adjusting the incline and choosing the speed at which they run. Without an activity or fitness tracker, a treadmill also safely measures calories burned, running speed, and the distance traveled without extra work on the part of the runner. One of the easiest ways people mess up running on a treadmill is changing the length of their stride. The treadmill is constantly moving, so it becomes tempting for people to leap forward like a dear. If the runner’s foot seems to be ahead of the rest of their body, this means they have thrown off their center of gravity. To avoid accidents and injuries, it’s important for individuals to keep their feet under their bodies. Long strides put a lot of force on the body and might mean there is less room for running since the user keeps getting closer to the front of the treadmill belt. Another common mistake is using improper running form. 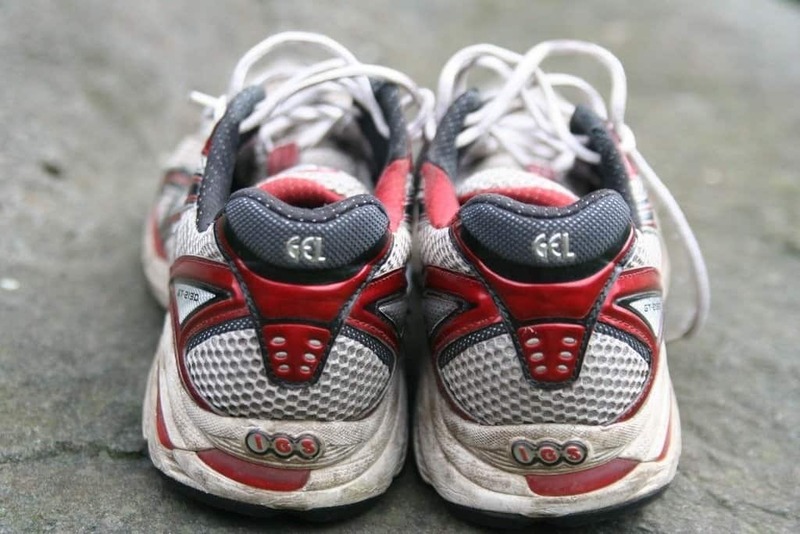 The Science of Running recommends that people avoid over-correction and try to keep their foot as even as possible- this means the shoes should not be excessively padded and ankles shouldn’t roll too much. It’s also important for runners to keep their backs straight and tall. Many novice runners make the mistake of hunching their backs, which leads to problems later on like sore muscles or spine issues. People also should not land on their heel, but actually try to land on the balls of the feet first to avoid joint stress. For a visual of the proper treadmill running technique, take a look at this video. The Run Experience provides informative videos to prevent injury when using exercise equipment, amongst other things. Weslo is a brand of exercise equipment sold by the American manufacturer Icon Health & Fitness. The company specializes in making affordable treadmills for the standard runner that include some frills but don’t go overboard with the technology. The Weslo Cadence R 5.2 is one of the company’s most popular brands. This treadmill costs around $300 and is a simple machine with a space saver design. The exercise belt measures at 50 in. x 60 in. and there is a 2 position adjustable incline so people can practice on hills or a flat surface. Users need to manually adjust the incline themselves. Unlike a lot of treadmills, the Cadence R 5.2 includes a cushioning system under the belt to help reduce the chances of joint damage and provide a comfortable workout for users. There is a large LCD display which shows a lot of relevant information like the distance travelled, current speed, time spent running, and calories burned in a single workout. The Cadence R 5.2 folds for convenient storage and can support a person who weighs up to 250 lbs. without a problem. There are six included workout programs and a 90 day warranty for any problems. The top speed is around 10 mph. The Weslo Cadence G 5.9 is a simple treadmill that values affordability over excessive technological frills. It comes with six different workout programs, can fold up, and has two incline settings which a person can manually adjust. The original price for one of these machines is around $470, but people can also find models for around $280. The full machine weighs 117 lbs. and has dimensions of 68 x 31 x 10 in. The exercise belt measures in at 50 in. x 16 in. The top user weight limit is 275 lbs., but people who weigh 300 lbs. don’t seem to have a problem using the machine. The top speed is around 10 mph, which is the equivalent of a fast run. At first glance, these two Weslo Cadence machines look exactly alike. However, there are some important differences. First and foremost, the price is a little different but not dramatically. Some people want simple machines with few frills and might prefer the R 5.2 for its lower price. Unfortunately, this model does come with less cushioning under the exercise belt and tends to be noisier than the G 5.9 because it has more plastic bits and less padding on the bottom. Both machines have the same top running speed, but the G 5.9 can hold people who are heavier than the R 5.2’s weight limit. Both have the same manual inclines and come with 90 day warranties on parts. The LCD monitor on the G 5.9 also includes more information like the runner’s heart rate. So, which should be recommended? Ultimately, the G 5.9 doesn’t offer enough extra features to justify the higher cost. 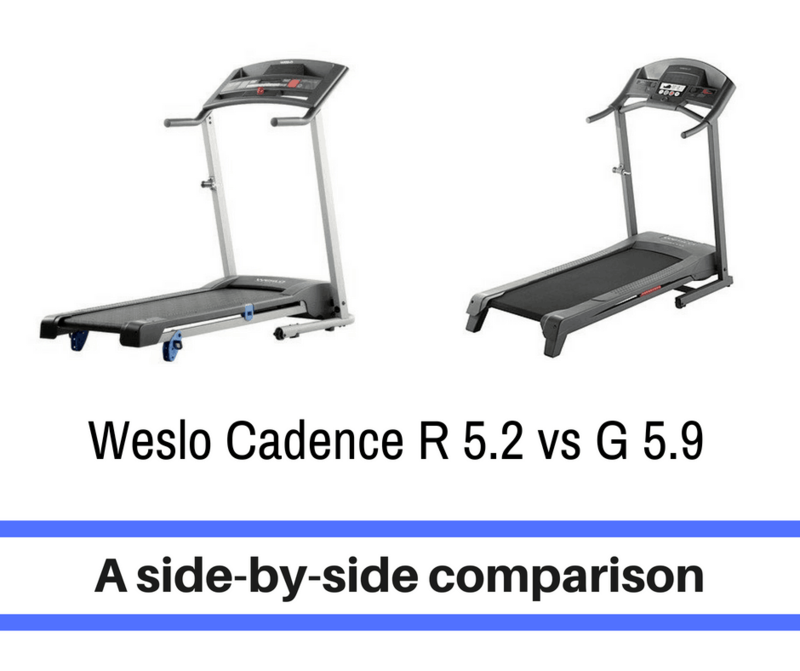 People who want a simple treadmill would have better luck with the Weslo Cadence R 5.2 since it has almost all of the same features as the G 5.9 but a much lower price. People don’t need to have a treadmill with lots of extra features in order to exercise and gain the benefits of running. In a lot of cases, it’s healthy to have a simple machine which still provides all of the benefits of running with the convenience of exercising inside.